Squares, Diamonds and Triangles….Oh My! We just published, our 60th pattern…. The Shape-a-Saurus portable Activity Center. 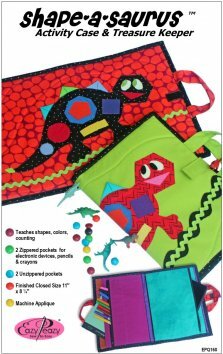 Meet the friendly dino who teaches kids shapes, colors and counting while providing secure pockets for paper, crayons, toys, and snacks. It’s the perfect way to transport electronic devices and anything that will entertain and keep children quiet and occupied when needed. Click Here for more information. 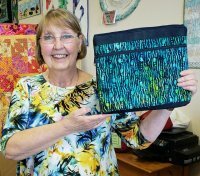 Here’s Anita Kelly, owner of Boutique 4 Quilters in West Melbourne, Florida. Anita made one of our Fab Folios but her shop had some cork in stock, so she made her version using cork for the back. Love her creativity!